Exactly why the end of the world is back in vogue is an interesting question. Part of it is presumably about the growing respectability of Science Fiction. Part of it’s probably also a function of the way Science Fiction itself has changed in recent years, the way the vistas of deep space that once occupied it have given way to the possibilities of our increasingly science fictional present. But the rise and rise of the apocalypse is also the expression of a deeper anxiety about what lies ahead, and our powerlessness to control it. Certainly it’s not coincidental so many contemporary dystopias are the result of environmental degradation or pandemics. 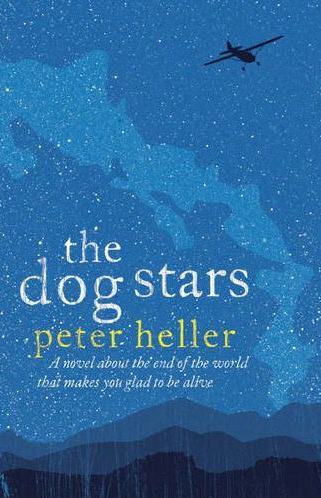 The Dog Stars, the debut novel by Peter Heller gives you both for the price of one. Set in the aftermath of an epidemic that has wiped out more than 99% of the population and left those that are left at the mercy of a rapidly warming climate, it focuses on one of the survivors, a man called Hig, who has managed to survive in the backblocks of North America. As the novel opens almost a decade has passed since the flu, years Hig has spent holed up in an old airport, alone save for his dog Jasper and another survivor, Bangley, a prickly survivalist with an often-vital taste for guns. Although they’re alone Hig and Jasper and Bangley don’t have it so bad. Using materials from the abandoned McMansions alongside the airport Hig has cobbled together a system of gardens, and while many of the animals have disappeared as the summers have warmed, presumably killed off by lack of water, there are enough left to supply meat and fish. Thanks to Bangley’s guns and strategies they are comparatively safe from the intermittent attacks by other survivors, many of who are, as Hig puts it, “mostly Not Nice”. And although Hig knows that it will not last forever, for now at least there is enough fuel for him to fly his beloved Cessna now and again. Yet while he is alive, Hig – a man still riven by the loss of his wife and unborn child – is not living, or not really, something that becomes painfully clear when a crisis convinces him to abandon his refuge and set off in search of the origin of a mysterious radio message. Obviously enough it’s not the most original of set-ups. But The Dog Stars has a clarity and force many novels like it lack. Partly this is about the integrity of the detail: Heller is an experienced outdoor journalist and it shows in the way he understands not just the terrain but the equipment. But it’s also about the writing. Despite his roughness Hig is – or was – a poet, a man fascinated by the poetry of Li Po and Li-Shang Yin, and the prose of the novel reflects that, capturing in its broken rhythms not just something of the spareness and clarity of Chinese poetry but the quality of Hig’s attention to his surroundings, and his only barely sublimated grief. These qualities, together with the novel’s occasional hints of the degree to which the events that have befallen Hig have altered him, and not always for the better mean The Dog Stars is, despite its occasional implausibilities and overly-familiar devices, never less than affecting, and occasionally deeply moving. Yet at the same time it’s difficult not to wonder whether it isn’t a little too consoling. Certainly there is more than a whiff of the cosy catastrophe about The Dog Stars, in particular the intimation of hope that comes in its final pages. More deeply though it – like many contemporary dystopias – seems more interested in romanticising our powerlessness in the face of a changing climate than trying to imagine our way past it.